Trying to time a 2010 Range Rover sport. Have all the tools to do it just curious of the timing marks because the tech data isn't really clear. Hello, my name is ***** ***** I am a Master and Advanced Level Certified Automotive Repair Technician with over 12 years experience and I&#39;ve personally worked on over 25,000 vehicles. I see you have a question about your Range Rover and I think I can help you.Give me a moment while I look up some info for you!Please feel free to ask any questions that come to mind. It is my goal to determine a remedy for your concern. I look forward to assisting with a speedy repair! Thank you. 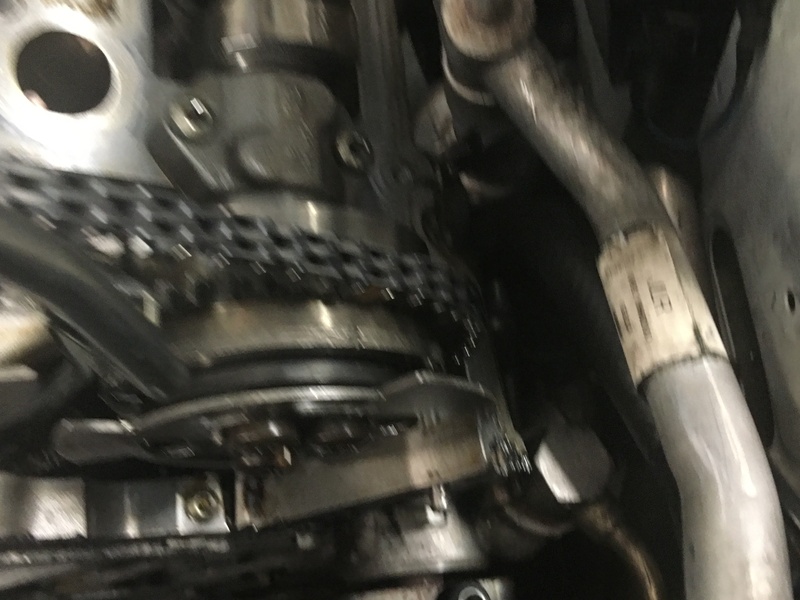 It does appear that Land Rover uses a special type of barring tool, specifically meant to hold the cams in alignment while the chain is installed. Its also important if the VVT cam units were removed for proper torquing procedure. However I will admit I&#39;ve &quot;gotten away&quot; in the past without using the manufacturers &quot;special&quot; tools.Check out the pictures I&#39;ve attached, hopefully it will aid you. And again, please feel free to ask any questions that you have, I&#39;m here to help you! Thanks again. P.S. In that first picture, that is a view of where they want the camshaft to sit. I forgot to say thank you for the picture you attached as well! Without a more &quot;head-on&quot; picture, its hard to tell if were aligned or not. Judging from the 3rd picture I sent you, I&#39;m inclined to say you may not be. Here&#39;s one more picture coming at ya. Its for the timing marks on the other side of the motor. Here's what I've got going. Nice pictures. I noticed you said you&#39;re still getting B2 over advanced. Did you have the timing cover apart to address this? What did you replace? I have a lot more info I want to share and I&#39;m still sifting thru all the technical pictures. This style of VVT system uses electro-magnetic actuators that push in the &quot;pins&quot; that stick out of the middle of each VVT sprocket. I have seen many issues with this system since Mercedes began using an identical system in the mid 2000&#39;s, that&#39;s the only reason I ask.Also just a side note, i do try to respond within 30 minutes of your last post. Sometimes its hard to be timely when I&#39;m helping other clients, so your patience is greatly appreciated. 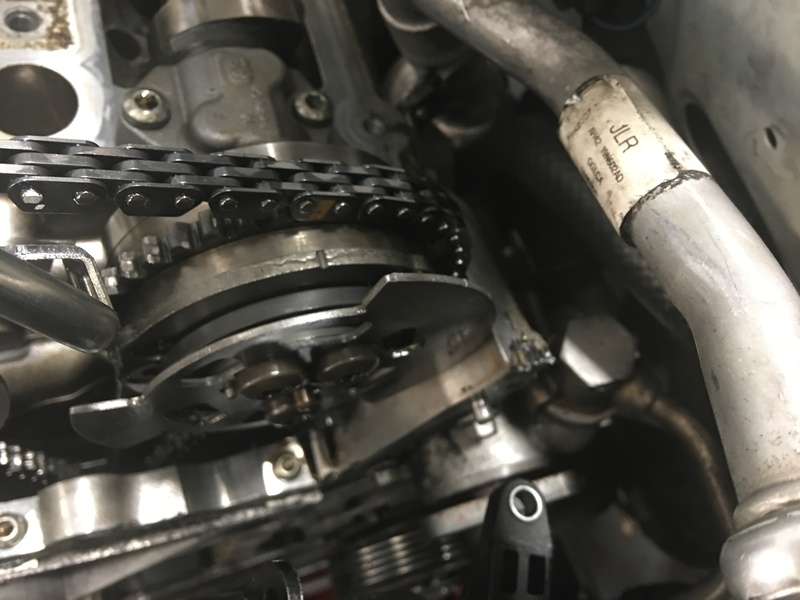 So the one side only being off kinds of puts my theory asside, but judging from the LR manual pictures, it looks like your chains are on the wrong sides.Notice how the B2 cam timing marks are much closer together than B1? Your pictures show just the opposite. Did you buy new chains, or just a tensioner? If so we can lookup the part numbers and confirm which on is right and left. Also, did you have the cam phasers (VVT Sprokets) off? I never took the chains off. I zip tied the chains in place when I changed the tensioners. Ok, then in that case here&#39;s what I would do. I&#39;d put everything back together and get it into running shape. Then I would first, switch the B2 Exhaust VVT Electronic actuator with the one from the B1 exhaust, all should be the same except B2 intake. If the code follows or stays on B2 Exhaust, I would then switch out the B2E CMP sensor from another bank, it appears these are all the same. 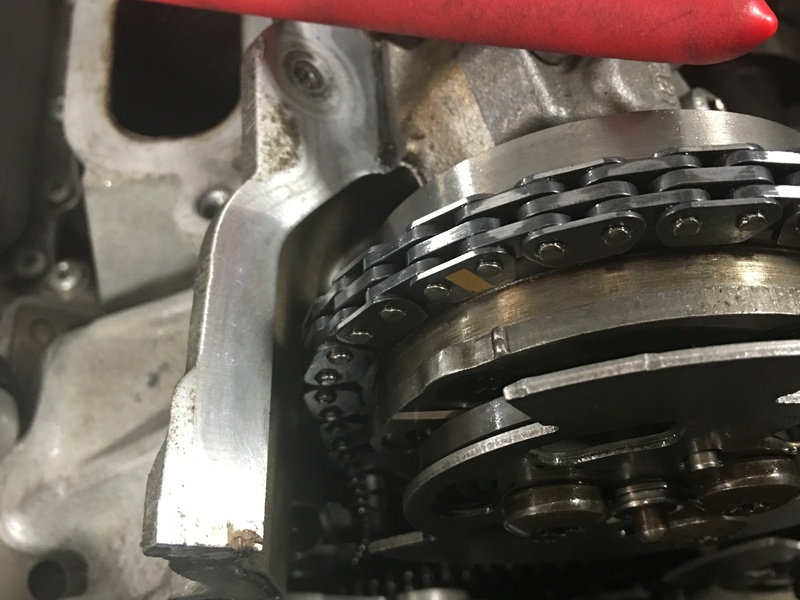 IF one of the VVT sprockets has failed, which I read can fail in the advanced position, these methods will be the only way of ruling it out, and then unfortunately if one of the sprockets has failed you will have to tear it down again close to the point where you&#39;re at now. Yay, the life of a technician! Of course check with your client and confirm that they didn&#39;t have a CEL on prior to coming in for the bad timing chain tensioner. 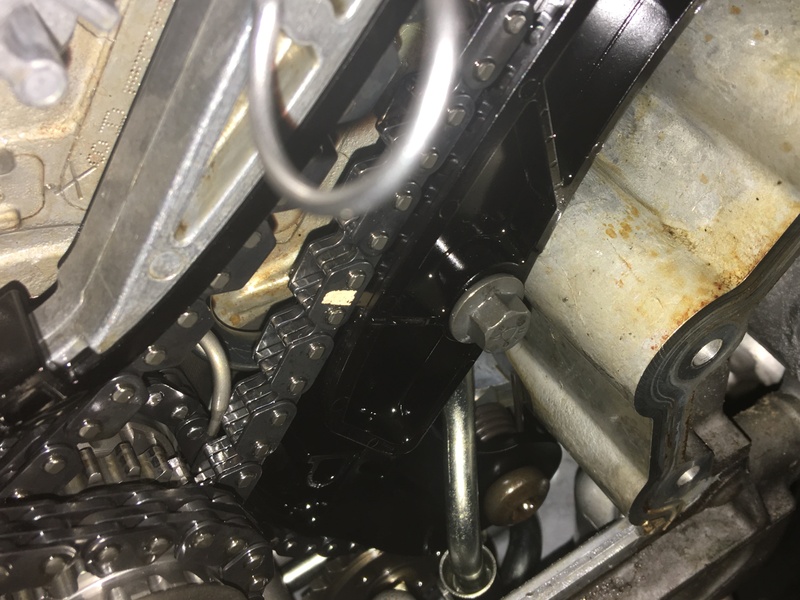 Additionally, it seems to me that these sprockets are quite sensitive to being disturbed, its possible if one turns out bad that the timing chain slapping all over it may have caused this affect. Remember, there is always cause and affect in the automotive world! My experience with this system is almost exactly what you&#39;re describing. 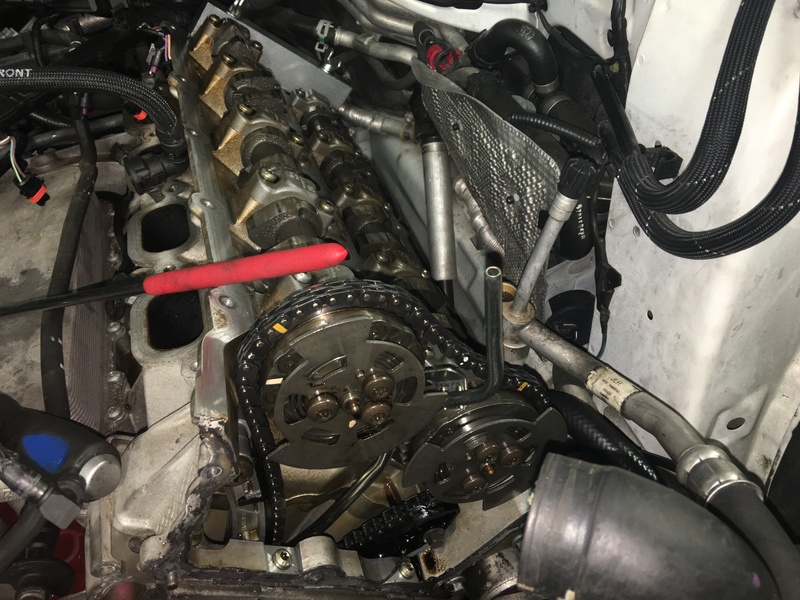 I did head gaskets and after everything was said and done I had a cam timing code. Tore it back down, confirmed everything. Put it all back together, then started playing around with the VVT system, actuators and sensors. I don&#39;t know if you have enough room in front of the 5.0 engine, but on mine I could leave the actuators out while the engine was running @ idle, then I used a little dish like end of a nut driver and pushed on those VVT &quot;pintles&quot; which caused a change in running, the only one that didn&#39;t cause a change in running was the bank throwing the code. I never figured out why that VVT sprocket went bad.Let me know if you would like me to provide any additional info, I am here to help! Hello, just checking in to see how the Land Rover was coming along. As always I&#39;m here to help. Also, please feel free to ask any questions you may have. Lastly, my goal is to provide you with excellent service &ndash; if you feel you have received anything less, please reply back as Ia m happy to address follow-up questions. Kindly rate me when you are ready. Thank you again! Was it the EM actuator or the VVT sprocket itself? Nice! That&#39;s so odd that a tensioner R&amp;R could have resulted in that. I&#39;m so glad that my experience with this issue helped. Again, please let me know if you ever need any followup questions answered. Otherwise if you wouldn&#39;t mind I&#39;d love it if you could 5-star me on this question so I can close it out. Thanks again!